Monday 26th June 2017 at 3pm-4pm, Lecture theatre S4, 16 Rainforest Walk, Clayton Campus. 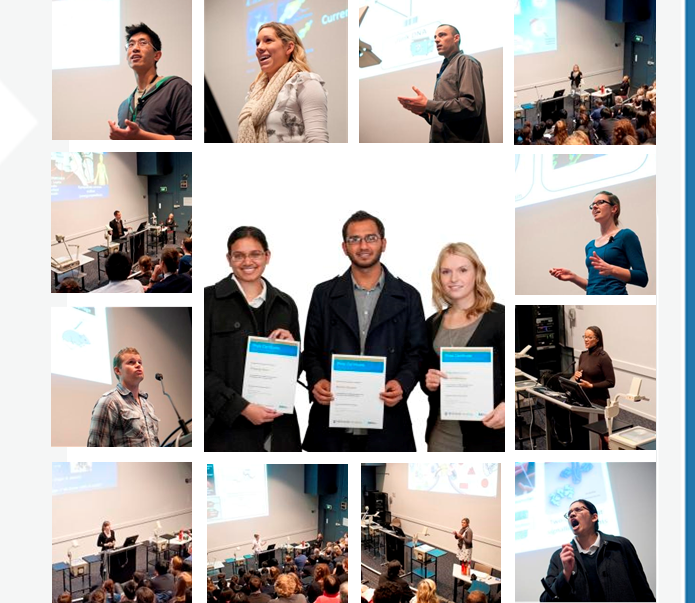 The 3MT competition highlights the importance of communication skills! 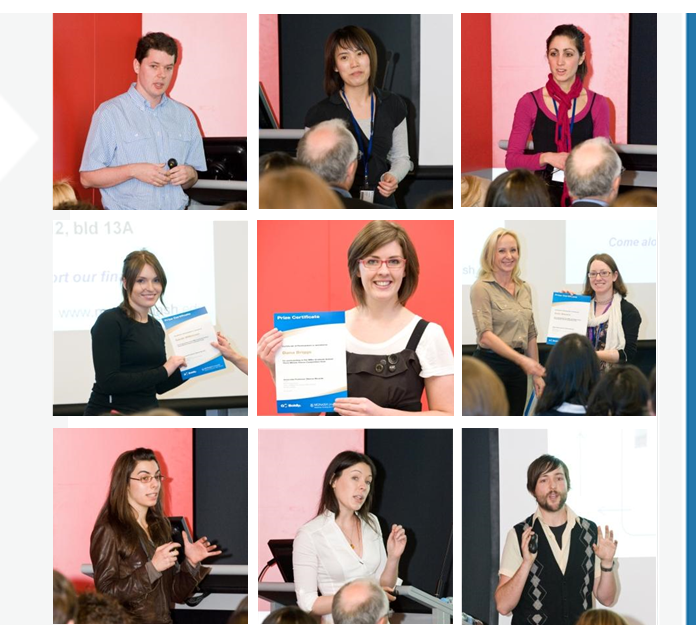 Higher Degree Research candidates have three minutes to explain their research in language that can be understood by a general audience. It's a competition against the clock and students are allowed the use of one slide to assist them. Interested students must register for the competition online. Online registration closes midnight 31st May. Registering students should also email their departmental Graduate Coordinator to inform them that they have registered. Each SOBS department will run a heat in order to select the top two students for entry into the BDI Graduate School final. Students will be judged by department members according to a common set of selection criteria (see university guidelines). The BDI Graduate School will run a final that involves the top two students from each department in order to select the winner. Students will be judged by senior faculty/university academics according to a common set of the selection criteria (see university guidelines below). 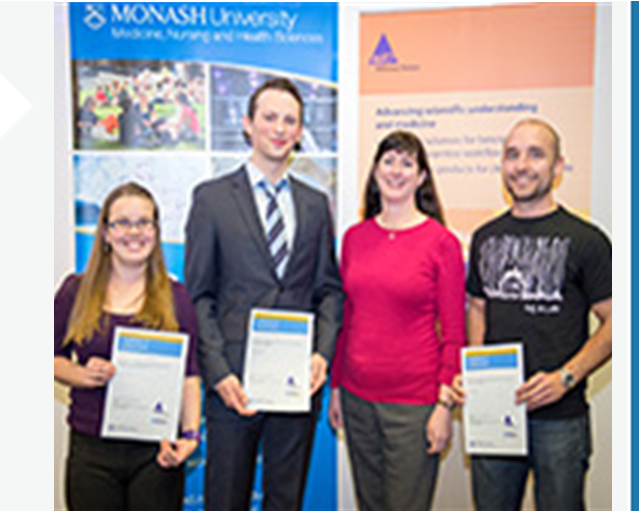 Eligibility, selection criteria and presentation guidelines can be found here. 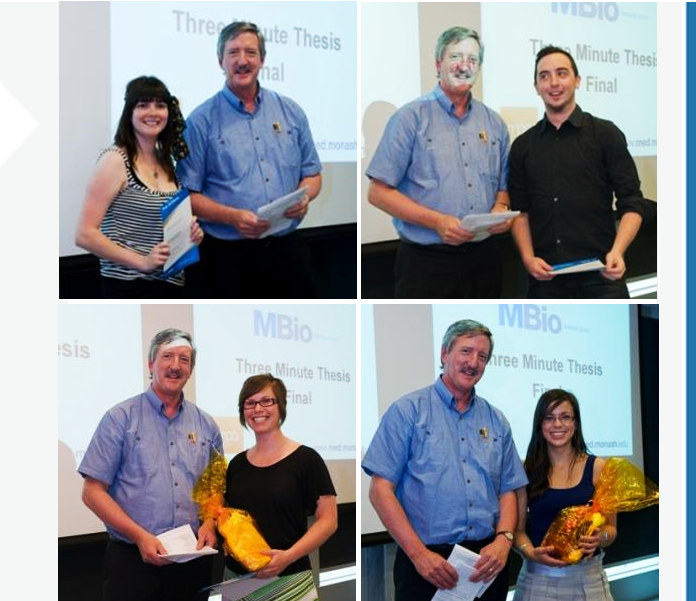 The winners of the Three Minute Thesis competition held on 2nd August 2016, were Cara Nethercott, from the Department of Microbiology, for her presentation A Bad Bug and a Terrible Toxin: How they play nasty with your White Blood Cells and Blake Riley, from the Department of Biochemistry & Molecular Biology, for his presentation Changing the crab's claw": Evolving a bacteria-killing enzyme. Both received $200 and went on to compete in the Faculty final. Runner up went to Caitlin Lewis from the Department of Pharmacology for her presentation The Macrophage: Hero or Villain of Heart Disease. She received $100. Caitlin also won the People’s Choice Award and received a further $100. 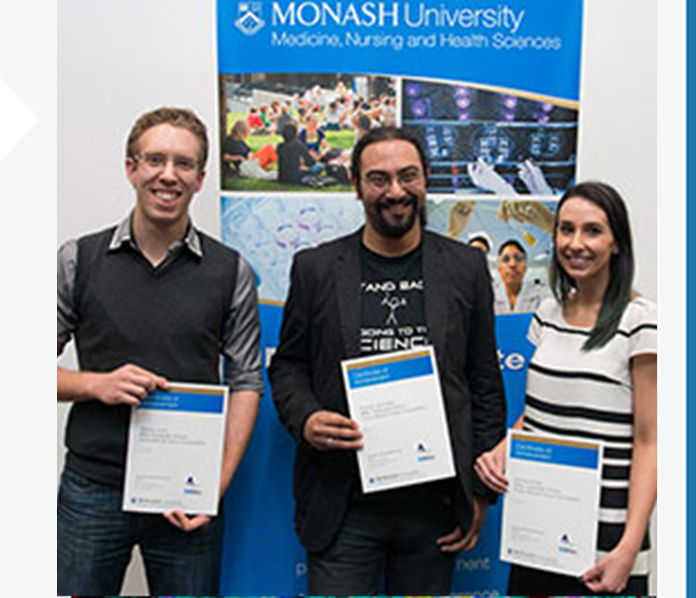 Winner 1: Megan Evans (Department of Pharmacology) - "Placental Stem Cells: A future therapy for stroke"
Winner 2: Brooke Huuske (Department of Anatomy and Developmental Biology) - "You, me and pee"
Runner up: Mitchell Batty (Department of Microbiology) - "Aiming drugs at a bad bug"
Winner 1: Victor Suturin (Department of Physiology) – "The killer cure"
Winner 2: Felix Deuss (Department of Biochemistry and Molecular Biology) – "To Kill or Not to Kill?" Runner up: Brooke Huuskes (Department of Anatomy and Developmental Biology) – "Relaxin' with stem cells"
Winner 1: Danielle Rhodes (Department of Anatomy and Developmental Biology) – "Katanin: A Cellular Samurai"
Winner 2: Ben Seyer (Department of Physiology) – "Targeting Hypometabolism in Alzheimer's Disease"
Runner up: Adam Shahine (Department of Biochemistry and Molecular Biology) – "H.M.A.S Tuberculosis Under Siege"
Winner 1: Jessica Van Gent (Department of Anatomy and Developmental Biology) -"Deal or No Deal: Cell fate choices in the developing testis". Winner 2: Michael Kraakman (Department of Biochemistry and Molecular Biology) - "Russel Crowe and Lego Man. An unbeatable recipe for conveying complex biological phenomena to lay audiences". Michael also won the faculty competition. Runner up: Adam Shahine (Department of Biochemistry and Molecular Biology) - "Severing the supply route between mycobacteria and host macrophages". Winner 1: Mohsin Sarwar (Department of Pharmacology) - "The mechanisms of relaxin's cardiovascular effects". Winner 2: Priyangi Alwis (Department of Microbiology) - "Characterisation of Burhokderia pseudomallei two-component signal transduction systems". 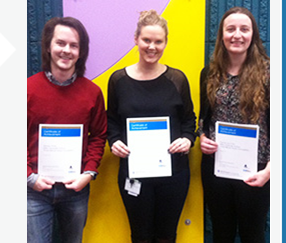 Runner-up: Sarah Wilkinson (Department of Anatomy and Developmental Biology) - "Prostate cancer: the usual suspects". Winner 1: Dana Briggs (Department of Physiology) - "The future is fat". Winner 2: Kate MacKin (Department of Microbiology) - "Does Clostridium difficile form biofilms?". Runner-up: Sarah Wilkinson (Department of Anatomy and Developmental Biology) - "Stromal hedgehog signaling mediates prostate epithelial cell transformation". 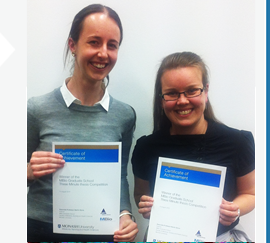 Winner 1: Renee Duncan (Department of Biochemistry and Molecular Biology) - "MASP-2 and C1s: the samurai of complement". Winner 2: Ken Walker (Department of Anatomy and Developmental Biology) - "Nephrons in the kidney: the more the merrier?". 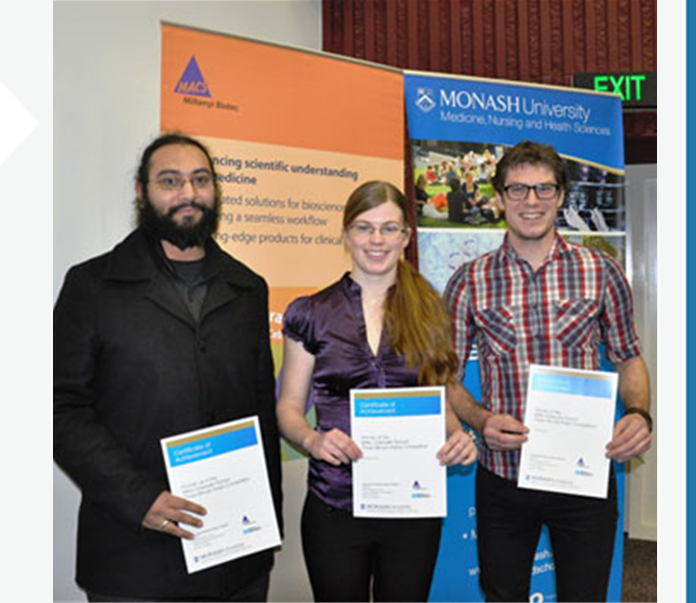 3rd place - Sarah Lockie (Department of Physiology) - "Forbidden fruit: why hamburgers are more tempting than apples". 4th place - Megan O'Reilly (Department of Anatomy and Developmental Biology) - "Inhalation of high oxygen concentrations after birth: does it affect the development of the smaller airways of the lung? ".